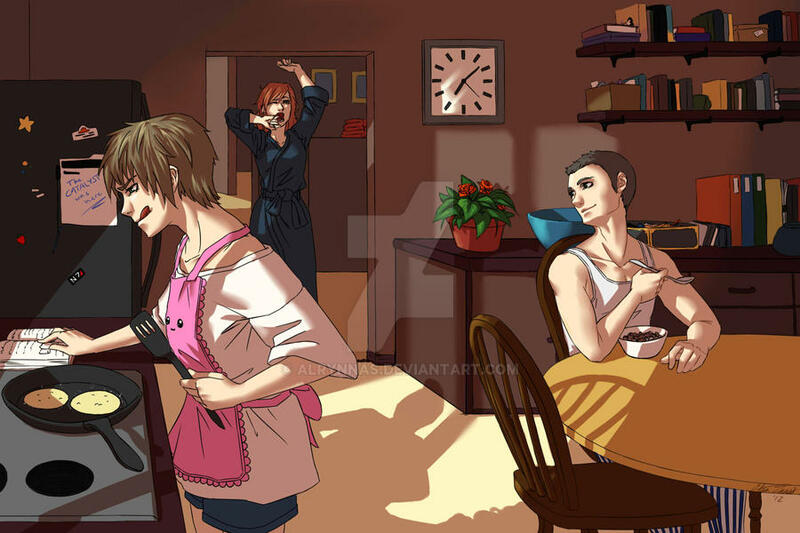 "Just a normal day for the Shepards. Alan is cooking, as usual, Dad's awake, and Mom just got up. Only a boy wearing a cute, frilly apron can pull it off by looking so adorable! Why is Alan the one cooking? 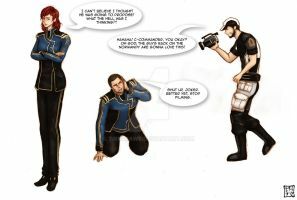 I don't think both parents being in the Alliance military while trying to save the universe had any chance of learning how to cook. John, Jane, and Alan Shepard. I've never played any of the Mass Effect games, but this was still fun to work on, especially the lighting xD That's where I went to town since I wanted to get that morning feel. Got any questions about commissions? Note me or take a look here [link] ! 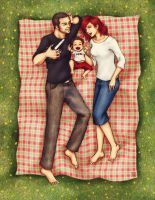 My creator thinks that this cute with the two Shepard-Commanders and their child. Great job with the lighting- I think you really succeeded in getting the angle and brightness right for early morning! lol grate work i love it! I KNEW IT! I knew someone would get it! Yes, the Star Child is EVERYWHERE. A pink apron + Little Boy = Instant Cuteness and innocent fanservice. I feel so bad, but I don't think Alan has a problem with it. I think he's slightly on the girly side when it comes to the kitchen. He's the only cook in the family, surprisingly. Why do you think John's only eating cereal? Thank you for the comment, Card! Well, try to admin 9 groups! I'll help you with everything I can! But but but...you're smart and super cool! If you can just gimme a kick in the right direction, I can figure out the rest. Just need a hand to hold to make sure all the permissions are where they should be. XD DID I MENTION HOW MUCH I LOVE YOU?! The frilly apron is adorable on Alan! Aww, hahah, thank you xD That means a lot. And don't forget about the possibility of a drawing/writing art trade x) Would totally be fine with something like that with you. Is that what I'm hearing?? *tries to unblow mind* You need it for your lovely writing! Once I'm done writing with Chapter 80, 81 and Chapter 15 on my Assassin's Creed fic, tell me what you want written!!!! Actually, do it now!!! WHILE THE INSPIRATION IS FRESH!!! And actually here after months of enslavement!! Hahah, all righty then xD I'll take this over to notes. Alryn's awesome! I'm still in love with Elia's and Noctis's picture. Over a thousand or more. I'll have Chapter 81 also finished as well. Now I'm at a part where this is the "connection part" of all the events I have planned. Dear lord. I'm still on my Writer's Block. I've been on writer's block for 3 months...or hell even more!! My Assassin's Creed story: a year!!! Luna, I believe in you. I'd even write something for you! If I get the chance, I might commission a picture for you! This is extremely well done!! The light coming in through the window is great!! Excellent job!! I love that the mom is the last one up and the son is cooking breakfast! The lighting is AMAZING. It really does feel like it's morning! And yes, Jane's a late sleeper and Alan's the one who's usually up early in the morning to make breakfast.